Visit site to review customer requirements, produce CAD drawings and manufacture Hydraulic clamp to drawing number AD-12-2012-1. The clamp is designed to aid fitting the rotor pole key onto the brick and hub assembly of 922700 Sizewell project. To press the pole keys into position it will feature a hand pump operated hydraulic cylinder with a 300mm stroke and 15 tonnes of load. This will be mounted in a G clamp style assembly which has one fixed end and one adjustable end for accurate location on the Hub assembly. The clamp will feature lifting points so it can be easily positioned over the Hub assembly to carry out the installation of the pole keys. The hand pump for the hydraulic cylinder will be positioned on a trolley which will also act as somewhere to store the clamp when it’s not in use, this will be fitted with 4 off 200mm diameter castors with foot brakes to lock it in place when the hand pump is in use. 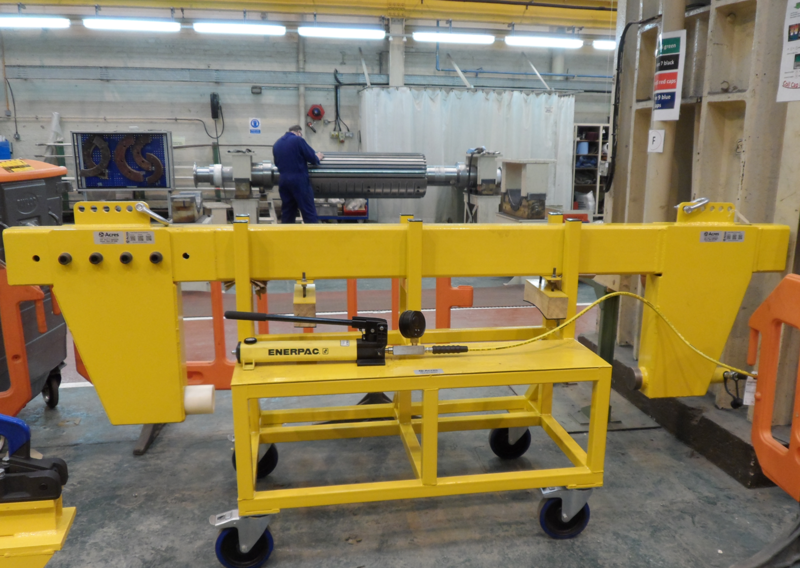 Approximate overall size of the Clamp Unit – 3000mm (L) x 150mm (W) x 700mm (H). Approximate overall size of the Trolley unit – 1800mm (L) x 800mm (W) x 900mm (H).